California Locally Produced, Gluten Free, Pure Cane Sugar, Fountain Soda! This is that TRUE orange soda flavor you were looking for. 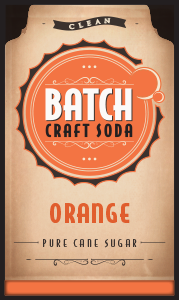 Batch Craft Orange Soda has a wonderfully fragrant aroma and vivid color you can enjoy anytime. This is the perfect sweet treat for your beefy BBQ cook out. Contact us and purchase your Batch Craft Soda TODAY!